Finding hotels that fall into stylish city stays, romantic rural retreats and chic coastal getaways can be hard to come by. From Istanbul to the Dominican Republic, Portugal to Thailand — and a handful of destinations in between — these 10 properties that will get even the most modest of travellers hunting down their next trip. Have the tennis whites and golf plaids pressed and ready for Rosewood Tucker’s Point hotel in Bermuda, a luxe playground for the country club set with views of the glittering pink beaches of Castle Harbour and Harrington Sound. As Britain’s oldest colony, you’ll catch sight of a bobby directing traffic or a heated cricket match. But this sun-splashed island is decidedly tropical, moving to the rhythms of calypso and reggae and the resort’s four stylish swimming pools, spoiling spa, manicured golf course and pro-worthy tennis courts are at your whim for playing the days away. Dominican Republic hotel Casas del XVI invites guests to quantum leap back to the colonial era – with the added benefit of all mod cons, naturally. 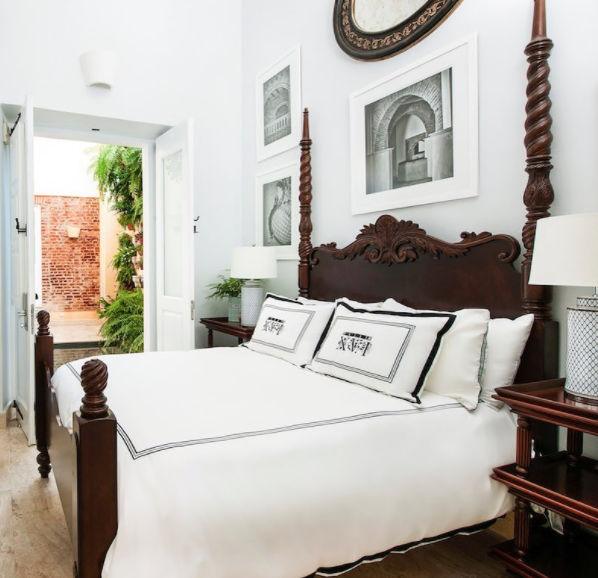 Two casas, in the centre of Santo Domingo’s UNESCO World Heritage site Colonial City, have been lovingly restored (dare we say, improved upon) and fashioned into seven luxury suites. However, a supernaturally helpful private butler, peaceful palm-strewn courtyards to siesta in and a bygone setting support the illusion that you’re a fresh-off-the-boat hidalgo paying homage to the New World. Tucked away across a cerulean Caribbean bay from the historic port town of Portobelo, El Otro Lado hotel is a laid-back, yet luxurious, outpost of traditional Panamanian culture that’s right at home in the jungle-blanketed wild. With original artwork adorning every room, local woodworkers carving sculptures on site, creative Caribbean cuisine and an ambitious list of activities for outdoor enthusiasts, this jungle retreat is the ideal mix of art and adventure. Bed down in the rainforest at The Byron at Byron Resort and Spa, a tropical treat with an excellent restaurant, award-winning spa and flocks of resident birds and butterflies. Toast the forest from the glittering green pool, stroll to the beach or laze around in your fig-and-fern-surveying room. Where else can Spanish Gothic, art deco, noir, rocker chic and hipster cool coexist so peacefully but at the Ace Hotel Downtown Los Angeles? Located in the revamped United Artists Theatre building in the up-and-coming neighbourhood’s once-great Theater District, the hotel has generations of cool, and uses them to its utmost advantage, from its scenery rooftop bar to its Brooklyn-meets-California restaurant. Originally the Ottoman Bank, Vault Karaköy by House Hotels in Istanbul has kept its classic architecture and charming historic features (including the eponymous vaults) but added plenty of modern delights: there’s a spa, stylish modern decor and even its own in-house art curator. Rooms from $263 per night. The neoclassical finery of Bath’s Royal Crescent Hotel, in the centre of one of the country’s most evocative streets, makes it the English escape of which elegant dreams are made. Add the first-class food and top-notch spa, and you’ll never want to leave. At Italian-influenced Point Yamu by Como, rooms are immaculately styled by Paola Navalone and brilliant pizzas are served poolside at La Sirena restaurant. Thailand sings through, too, thanks to the Phuket-inspired artworks in the lobby, Peranakan-Thai cuisine in Nahmyaa restaurant and the jaw-drop views of Phang Nga Bay. If someone with a summer home in the Hamptons decided to build a hotel, it would be Topping Rose House.With just the right doses of gallerist-curated art, historic and modern architecture, anything-you-can-dream-of service, farm-to-table cuisine and the understated luxury that well-heeled New Yorkers expect, the Bridgehampton hideaway might actually be better than your own private Hamptons home. Or, does your summer home come with a free car and beach passes?